One of the hardest things about losing my dad is that there are just so many things I’d like to cook for him. After a certain passage of time, the distinguishable presence of a loved one begins to fade—the distinct quality of their voice, the shape of their face in three dimensions, the particular quirks and habits. It becomes more difficult to guess what they might have said in a particular situation, how they would react to a comment or a joke, what books you might recommend to them now, or what movies you would take them to. I find it terrifying, in fact, the way passage of time seems to make it increasingly difficult for me to conjure up my father the way he was, the way he might be now. Difficult, too, because the more time that goes by, the more different I am, perhaps unrecognizable to him. My dad died before I earned a Masters degree, before I got my first full-time job, before I bought myself a car and did my own taxes and grew my hair out long and then cut it again. I hate that he has missed all of this, and I have missed him in it. I have wondered, doubted, that I might be forgetting him, losing him. But the one place I still feel certain of him is in the kitchen. I know, instinctively, the dishes he would want, the moment he would sneak a warm treat from the oven, the recipes that would dazzle him and make him proud. This is one of them. These lamb meatballs are rich, satisfying, and incredibly flavorful. They also freeze well, so feel free to make a big batch! Sauté the onion & garlic in a bit of vegetable oil until soft. Once they cool, toss them into a big bowl with the rest of the meatball ingredients. Using your hands, form meatballs about an inch in diameter. (I like to keep them on a sheet pan until they’re all ready.) Once you’re ready, heat a cup of vegetable oil in a deep saucepan over medium-high heat. Fry the meatballs until light brown, approximately four minutes on each side. If you want to freeze or keep the meatballs separate from the gravy, you can finish them in a 350˚ oven, which should take only 10-12 minutes. If you’re planning to serve them, just keep them to the side or in a low oven while you make the gravy. In a large, heavy bottomed pot, heat a quarter cup of vegetable oil over medium-low heat until it shimmers. Add the cumin and wait for it to crack before tossing in the garlic, ginger, & onion. 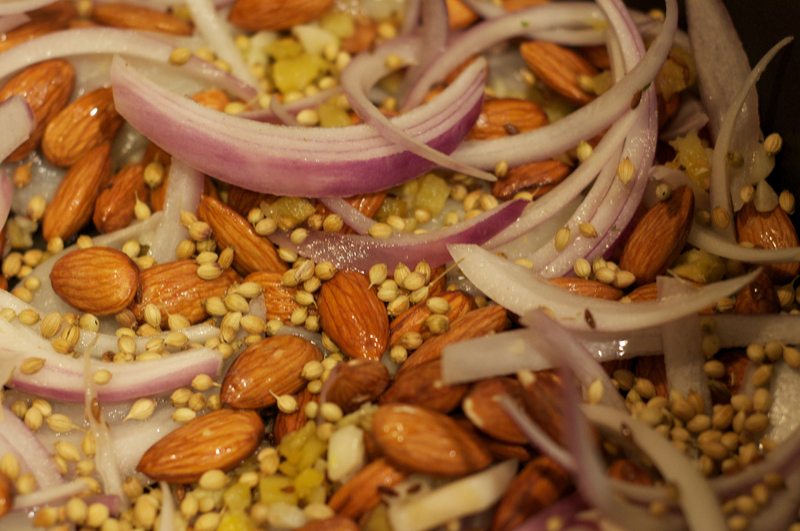 Cook for a few minutes, then add the almonds and whole coriander. Cook it all down until soft, and the onions are translucent, adding more oil during the cooking if necessary. This whole process will take about fifteen minutes. Toss in the tomatoes and stir everything together. If you have an immersion blender, go ahead and put it to work. If you’re using a conventional blender, allow the mixture to cool before blending it in batches. Process until the mixture has reached your desired texture (I like mine a little bit chunky). Add the sour sour cream to the gravy, mixing thoroughly until it turns light pink. Reheat the gravy over medium heat until bubbling—be sure to stir regularly so it doesn’t stick to the bottom. Add the partially cooked meatballs to the gravy and let them finish cooking there. Serve over basmati rice, garnish with cilantro. *Many of you may be able to buy paneer, which is a mild Indian cheese, at a specialty grocery store. If not, you can make your own (it’s actually very easy!) or substitute a similar soft, mild cheese: farmer’s cheese, queso fresco, or a ricotta. If you’re using ricotta, which can sometimes be watery, squeeze it out in a cheesecloth first. Aw, you choked me up a bit with the intro. I’m sure that this recipe would be one of many things that he would be proud of in your life now. That being said it looks incredible. Thank you for sharing! I can’t beleive I was rooting for eggplant (though I hope you’ll do that another time!) Lovely post and yummy recipe! Oh you. You blow me away. xo. This post would be beautiful even without the recipe. But this recipe? This is on the list for the weekend. I am alternately wiping tears from the corners of my eyes, and trying not to drool. And I’m at my cubicle. Ah well, I don’t care if my coworkers think I’m (more) nuts. as always, thank you. for sharing, for capturing, and for allowing us to connect to you as well as to our own unspoken feelings. i love you. YUM. 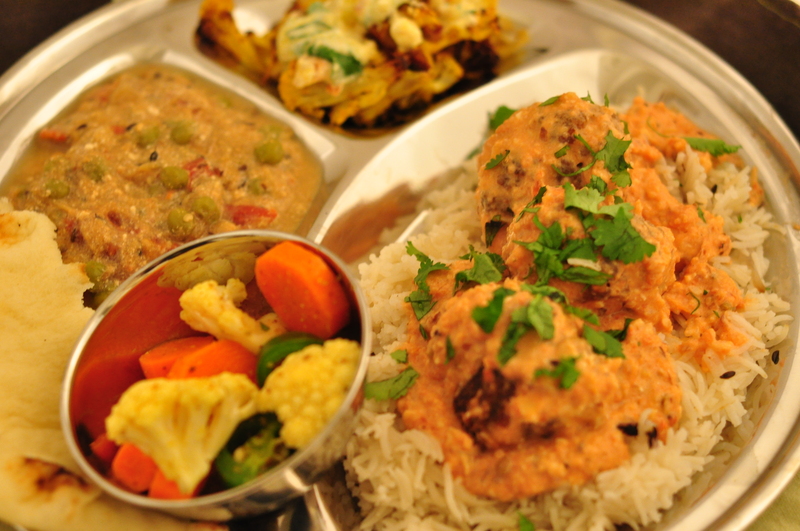 Nishta, what are the rest of the deliciouses on the plate? Phoo-D–thank you, as always, for visiting & your generous comments. the lamb *is* good, I hope you & Mr. B can try it sometime! Maninas–thank you for the visit & for taking the time to comment! I do think that the paneer adds a lot of richness to the koftas & the chickpea flour works well as a binder, doesn’t clutter the flavors. Joh–thanks for that mental image, it made me smile 🙂 You are so lovely & generous, as always. please let me know how it turns out after you try it this weekend! Rebecca–i love you back. a lot. apronless–I *knew* someone might ask that question, should have figured it would be you! okay, contents of the plate are lamb kofta with “proper Indian girl” rice (soon to be blogged about), vegetable achar (pickle), roasted cauliflower, the eggplant dish everyone keeps requesting which will come soon, & cheater’s naan from the grocery store! Sigh, boy do I know those feelings. Somewhat funny story too. After my father-in-law died and the flurry of activity that comes after the death we the family we left alone to try to breathe again. I remember that it was Oscar night. But we all needed to be nourished, not just fed. So the family went out for dinner. For Indian.